This no-cook easy and fast hollandaise sauce is a beautiful silky texture and rich yellow colour with a slight tang of lemon. It is absolutely delicious over vegetables, chicken, toast or eggs. I’ve poured it over eggs to make Eggs Benedict in the picture above. 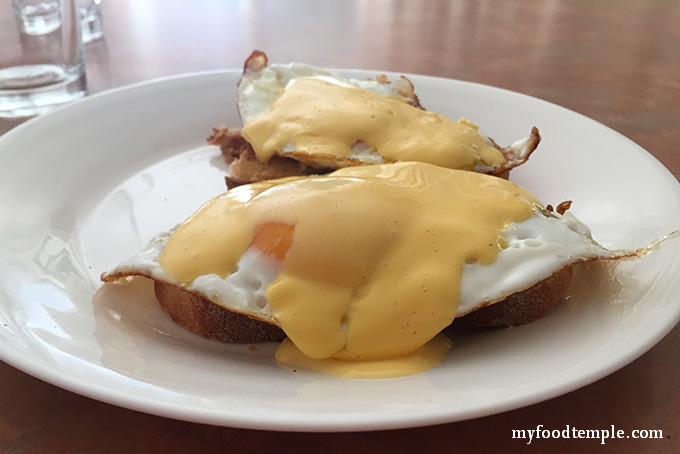 I usually poach the eggs, but in this case, I lightly fried them on one side only, serving sunny side up with hollandaise poured over the top – scrumptious! Start by measuring out the ingredients, and getting the equipment ready: a stick blender, tall narrow plastic container suited to a stick blender, a teaspoon measure and a 1/4 cup measure. Throw in the egg yolks and blend for 15 seconds, then add the lemon juice and salt slowly while blending for about a minute until desired thickness is reached – then serve. Check thickness at 15 second intervals if uncertain. Hollandaise cannot be reheated. Serve it immediately or soon after making it for best results. The hollandaise sauce should be a silky shiny yellow, not too thick, not too thin. You can always stop the blender and test it regularly to find the perfect timing for your own blender. I always serve it within fifteen minutes of making it. Love this stuff! It is so quick and easy to make, and tastes as good as the best hollandaise sauce you will find in a great cafe.